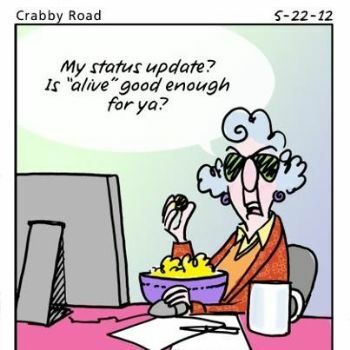 "My status update? Is 'alive' good enough for ya?" 103 passengers and only 40 meals boarded an international flight. It's Go to an Art Museum Today! Field Trip! Go to a museum today and enjoy the art collections. Check with your local museums as there may be discounts in honor of today. It's Carl Sagan Day (celebrates the life, teachings and legacy of Carl Sagan, born this day in 1934; he is known for his contributions to science, especially the fields of astronomy, cosmology, astrophysics, and astrobiology), Chaos Never Dies Day (you may as well face it, life is chaotic and today is the time to embrace the inherent confusion of life; stop driving yourself crazy by trying to control all aspects of your life and learn to embrace, enjoy, and roll with wild-ride that is life), Microtia Awareness Day (raises awareness of microtia--an underdeveloped or missing outer ear--and atresia--underdeveloped ear canal), Scrapple Day (a food brought by the Pennsylvania Dutch from Germany, scrapple is made with minced scraps of usually port and mixed with cornmeal, flour and spices to form a mush that is fried, often with breakfast), and World Freedom Day (commemorates the fall of the Berlin Wall when, on this day in 1989, the East German government allowed the East Germans to freely travel to West Germany). In the vein of we can't let this happen again: In 1938, Nazis attack Jews and loot and burn their businesses and synagogues in a coordinated and widespread campaign throughout Germany and Austria. The event, later known as 'Kristallnacht' or the 'the night of broken glass,' will portend an even greater horror, the Holocaust. 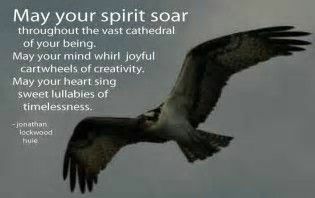 Hope we all soar today! I'm picturing a plane full of people , some talking loud as the booze fills them, others sleeping and snoring light freight trains and the stewardess wishing she had not promised so much booze. So much good stuff again today! I LOVE art museums! I try to visit one, big or small, whenever I travel.